There are some very few games out there which make you feel like the entire production team made them just for YOU, and not for everyone else. I can probably count them on my both hands. When our dear Editor-in-Chief covered this in The Revenge of Shinobi sometime ago, I knew I had to share my thoughts on another game that gives that exact same feel. Welcome to the most biased feature about the best game ever. Back in 1991, Sega gamers were disappointed. Phantasy Star III: Generations of Doom, had not by any means lived up to the great expectations caused by the beloved prequels. The success of the first two Phantasy Star games had gone to Sega’s head. It put another team on the third project, along with an entirely new, risky concept. The result was what one may call a synonym for the word “rush-job,” which Sega promoted in Japanese television – without a single glimpse of the game itself – as the “King of RPG.” The result was original enough it could have been made into a franchise of its own, but it wasn’t Phantasy Star enough to be in this particular franchise. The next year, an enhanced version for the Mega CD was announced. Maybe they wanted to give the game another chance and fill in all the empty gaps in the cartridge version. The project was soon scrapped though, probably as its potential may not have been the best commecially. Instead, Sega put up a new, huge team to work two years on something that was meant to be the final chapter in the franchise and the ultimate Mega Drive RPG. Originally, the plan for Phantasy Star IV was to release it for the then-anticipated Mega CD, along with a cartridge version. The early title was said to be Phantasy Star IV: The Return of Alis. A mysterious screen shot was shown in Mega Play magazine in 1991, but it is uncertain if it came from that project. As development progressed, the game was said to have 240 MEGA POWER, a lot of anime, and more. But the project was soon abandoned, and The End of the Millennium production is obviously an entirely different game from the one we saw at the beginning. 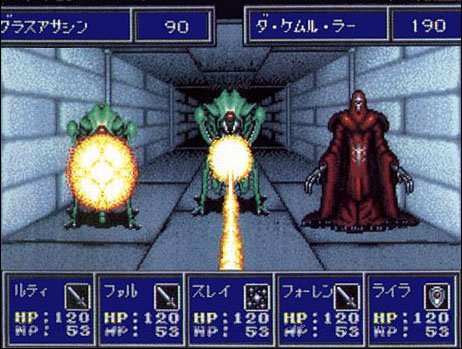 An early screen shot of it was leaked and showed a battle sequence taking place in a first person viewed dungeon, like in the original Master System game. However, that idea was disposed because it became “too monotonous,” and the final product saw instead a dungeon design similar to the one of Phantasy Star II. The CD version, whatever subtitle it had, was also put away, most likely due to the less-than-expected sales of the Mega CD. So what Japanese gamers got in 1993 was a cartridge version at a massive 24 MEGA POWER, twice as much as originally intended (for the cartridge version, that is). When Rieko Kodama, designer of the first two installments, had the task to form Team PSIV, the intention was to get as many original staff people as possible. Toru Yoshida, who together with Rieko Kodama, had his hands in a little bit of everything in this game, was the character designer of Phantasy Star II. A third very important person in the development was Akinori Nishiyama, who was also involved in most of the making and was a game tester for the original and writer and director for its sequel. The only one who had a significant role in the making of Generations of Doom was composer Izuho Takeuchi, who collaborated with the new talent M. Nakagaki this time. One might ask why Yuji Naka, programmer of the first two parts, didn’t participate. The answer is he was busy with a certain blue hedgehog. While the ill-fated aim to make Phantasy Star III something fresh with a new team failed, the complete opposite direction for the sequel of an “old” team clearly succeeded. Of all ideas that defined Phantasy Star in the first two games, in fact almost everything that occurs in both of them, returned in the fourth part. When you play the game, it feels like the developers wanted you to have a nostalgic kick every fifteen minutes, from the beginning to the end. It begins with hunters, this time Chaz Ashley and company, investigating a monster break-out. It continues with mid-point space travel, where the traces lead to the Dark Force once again. And it ends with a climax that ties all the stories together. Yes, even Generations of Doom gets baked in at some point. Number two must be the biggest model though, as both games share the same battle and dungeon views, they both begin on Motavia and continue on Dezolis, and they both have a similar sci-fi feel to them. But this doesn’t mean in any way that The End of the Millennium wasn’t a game good enough to stand on its own. The manga cut scenes were more than ever, and the sum of the total number of pictures are several hundred. Never before had a cartridge RPG been so visually expressive with images and words. It felt like watching a coloured manga book on your TV! And with new consoles bringing 3D and FMV as a standard right before it was released, Phantasy Star IV probably remains unique in that aspect. The battles also felt special. They were already animated and drawn well in the first game, bettered in the second in exchange for a blue grid, but the third isn’t even worth mentioning. Here, everything falls to place. With up to five characters against four enemies, the player could use “Macros,” something MMORP Gamers may be familiar with. A macro is a pre-determined command option that lets your characters execute their actions in the exact order you wish them to. Something that was so irritating in other RPGs was when the “healer” would cast her spell – to no avail – right before the “reviver” brought the patient back to life. In Phantasy Star IV, no more! Also, up to four characters may combine their skills and techniques into powerful combination attacks, something that was later used in Square’s awesome Chrono Trigger. I remember how I loved the unique individuality of all the characters, something that Final Fantasy VII disappointed me shortly after with, only having Limit Breaks as a difference. I have always thought memories are best preserved with accompanying music, tones that incorporate the atmosphere. As soon as you put Phantasy Star IV on, you will hear the heavy bass lines of The End of the Millennium, which are soon followed by some sweet synth chords and melodies. Never before or after has the intro track of a game embodied the feel and style of the rest of the music in such a splendid manner. What we are served here are simply divine futuristic techno-rock and synth ballads beyond any royal orchestra. It is such a cliché to reproduce a symphonic sound in RPGs, something that the composers probably knew when they instead made something more fitting with the sci-fi theme of the game. Electronic music must be what the sound hardware of the Mega Drive does best, which also becomes even more obvious when hearing renowned Yuzo Koshiro’s attempt of harmonious music with The Story of Thor. Whenever I put Phantasy Star IV on, I press B on the continue screen to get the sound test (only works if you have a file of a completed the game stored) and listen to most of the tracks before playing the game. What makes Phantasy Star IV so addictive is that it is among some very few RPGs that are also “pick up and play” games. You simply turn the game on and start from your save. The dungeons are easily navigated and the random encounters are well balanced. There are numerous skills available especially for regular battles as well as high Technique points for magicians. That helps, together with Macro, to make the battles varied, easy, and fast – just the way I want them. When not fighting, you empty the chests, explore until you find the boss, and kill him. Then, when you think you are done, you save and turn the game off. Sometimes I like it in long sittings, sometimes in small doses. But I will never get tired of it, nor will it ever age a day for me. Phantasy Star IV is simply the perfect game for me. Okay, maybe Boris Vallejo raped the character design with his box art, and the shop music is questionable, but hey – but even the sun has its spots. What are the most common closing words in a Sega-16 write-up? This game is a must-buy, of course! If you hate RPGs, Phantasy Star IV may be the only medicine to cure your illness. In fact, it might even cure AIDS! Once you’ve tried it though, you must be used to putting it together with food, sleep, and other mandatory parts of daily life until you die a happy man/woman. Listen to Dr. Zebbe von Quack and inject a big dose of Phantasy Star IV into yourself. It’s totally worth it! Special thanks to James Maxlow, founder of the Phantasy Star pages for providing the photo of Team PSIV.